The NES Remix series logo. NES Remix[a] is a compilation video game series for Wii U, developed by Nintendo and indieszero. The first game was simultaneously announced and released on December 18, 2013 on the Nintendo eShop following a Nintendo Direct presentation. A second game, NES Remix 2[b], was released on April 25, 2014. 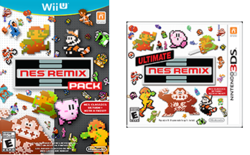 A retail edition consisting of both games, titled NES Remix Pack[c], was released on April 24, 2014 in Japan and December 5, 2014 in North America. Another title, Ultimate NES Remix[d] for Nintendo 3DS, was released on November 7, 2014 in Europe, November 8, 2014 in Australia, December 5, 2014 in North America and August 27, 2015 in Japan. The first game in the series, NES Remix, is composed of 16 vintage Nintendo Entertainment System games with a total of 204 challenges throughout; the second game, NES Remix 2, features 12 additional NES games with a further 169 challenges. Mostly composed of vintage excerpts from games, these compilations also present special categories of stages called remixes to additionally concoct unique challenges not possible in the original games. The purchase of both NES Remix and NES Remix 2 will unlock Championship Mode in the latter, sporting a new online leaderboards system. A screenshot of NES Remix gameplay. Most challenges are simply excerpts from vintage games, involving timed tasks such as speedrunning, clearing an area without dying, or defeating a certain number of enemies while utilizing a given power-up. The remix categories are additionally based on the fundamental reshaping or combination of games, sometimes by blending in more modern graphical features of the Wii U, for a new experience that may even be technologically impossible on the vintage NES. For example: completing a darkened level which is lit only by a spotlight superimposed over the player's character; navigating upon disappearing platforms in Super Mario Bros.; or playing a Donkey Kong stage as Link instead of Mario, challenged by Link's inability to jump. NES Remix 2 contains two particularly substantial remixes. Reminiscent of 1990's Nintendo World Championships tour across America, the Nintendo World Championships Remix is unlocked if NES Remix is also purchased and its save file is present. This remix pushes players through three successive challenges in Super Mario Bros., Super Mario Bros. 3, and Dr. Mario, in order to achieve a ranking score on its new online leaderboards. Super Luigi Bros.[e] is a Luigi themed remix of the entire Super Mario Bros. game which is now played reverse-mirrored from right to left. It features Luigi's higher jumping ability which had not been originally introduced until the 1986 Japanese sequel Super Mario Bros. 2. Ultimate NES Remix is a Nintendo 3DS game featuring a select compilation of games and challenges from the first two Wii U releases. It uniquely features Speed Mario Bros.[f], which is the entirety of the original Super Mario Bros. running at a much faster speed. Ultimate NES Remix also has a new mode known as Famicom Remix, which is unlocked by getting all the stars from the original missions. It has all the missions from the original mode, but all the games featured runs on the original Famicom hardware. Aside from Nintendo World Championships Remix's online leaderboards, a good performance will reward players with stars and points. These accumulate to unlock new challenge stages and collectible stamps. These stamped graphical icons, along with NES Remix 2's support for video recording, can add flair to Miiverse posts. Off-TV Play is supported. According to an IGN interview, the game started as a pet project by Nintendo Entertainment Analysis & Development (EAD) Tokyo's Koichi Hayashida, after having directed Super Mario 3D Land. With approval from group manager and producer Yoshiaki Koizumi, Hayashida developed the first 100 challenges of NES Remix by himself. Also co-directing Super Mario 3D World at the time, Hayashida was later assisted by three additional members of EAD Tokyo. Nintendo additionally hired Indieszero to help finish the game. Hayashida stated that he designed NES Remix partly out of desire to play NES games at work; he did not get to play many of these games as a child, and he considered the game an opportunity to make up for lost time. Hayashida was also inspired to break the games up into minigames for similar reasons, because as an adult he did not have as much time as he did as a child, but he still wanted to play later "scenes" in the games. Hayashida expressed his belief that NES Remix should be completely authentic to its vintage roots. To this end, the compilation is based entirely on accurate emulation of the NES's hardware and on the original game software. This includes hardware glitches such as frame rate slowdown when too many characters are on the screen, and software bugs. Hayashida stated that these were intricate parts of the original and directly affect the difficulty and so they were not changed. Hayashida also spoke similarly about the controls; even if they were not considered ideal, he understood that they had been conceived that way for a reason and so they were unaltered for NES Remix. In an interview with gaming website Eurogamer, Hayashida revealed that NES Remix would have been more difficult to develop for the Nintendo 3DS handheld system, adding that the development team required "some more machine power" in order to achieve the desired result at that time. Hayashida also noted that his familiarity with the Wii U architecture, having resulted from his work on Super Mario 3D World, lent itself well to the early development of NES Remix. However, a version of the game for the Nintendo 3DS, known as Ultimate NES Remix, was eventually announced. IGN rated NES Remix at 8.0 out of 10.0. While they did find this first compilation enjoyable, they criticized the lack of multiplayer functionality and online leaderboards as a "startling oversight", and wished that a greater quantity and quality of titles had been included. They suggested that Nintendo could have more fundamentally altered certain vintage games, such as by improving upon the "frustrating" play control of the vintage Ice Climber, Tennis, or Clu Clu Land, or by making Pinball more "fun". IGN's follow-up review for NES Remix 2 is also overall positive, rating it at 7.7 out of 10.0. While noting this sequel's fulfillment of their original request for leaderboards and for a superior selection of games, IGN says about the remix portion of the collection that "better games don't necessarily make for better remixes". They specifically commend Nintendo's "great job of revealing the overlooked, clever design" of the Japanese Super Mario Bros. 2, and summarily praise the overall collection by "officially demanding more". GameSpot assigns a 7.0 out of 10.0, calling NES Remix 2 "a delightful experience" with "more than enough content to keep you busy ... for a good while". ^ a b c d e Otero, Jose (23 April 2014). "How Mario 3D World's Co-Director Gave NES Games a Second Life". IGN. Ziff Davis. Retrieved May 3, 2014. ^ Plunkett, Luke (February 13, 2014). "NES Remix 2 Mods Original Super Mario Bros. To Make Luigi The Star". Kotaku.com. Retrieved 2014-03-26. ^ Kubba, Sinan (August 29, 2014). "Ultimate NES Remix slides onto 3DS later this year [update]". Joystiq. Retrieved August 29, 2014. ^ Gilbert, Ben (2013-12-18). "'NES Remix' takes classic NES games and...remixes them for Wii U, available today for $15". Engadget.com. Retrieved 2014-03-02. ^ "Virtual Console | NES™ Remix". Nintendo. Retrieved 2014-03-02. ^ Matulef, Jeffrey (21 April 2014). "NES Remix needed "more machine power" than the 3DS, says director". Eurogamer. Gamer Network. Retrieved 22 April 2014. ^ Champane, Jimmy. "ULTIMATE NES REMIX COMING TO 3DS". IGN. Retrieved 15 October 2014. ^ Claiborn, Samuel (December 20, 2013). "NES Remix Review". IGN. Retrieved March 2, 2014. ^ Claiborn, Samuel (April 23, 2014). "NES Remix 2 Review: Retro Redux". IGN. Retrieved April 24, 2014. ^ Venter, Jason (April 21, 2014). "NES Remix 2 Review". Retrieved April 24, 2014. This page was last edited on 29 March 2019, at 22:44 (UTC).